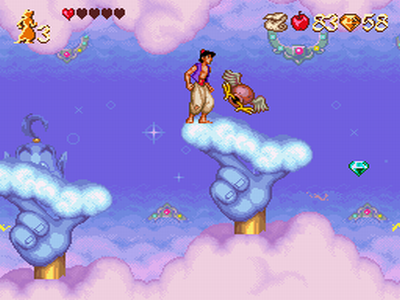 Their have been a lot Aladdin games made since its release in 1993 but the two best selling Aladdin games always seem to cause arguments among fans. 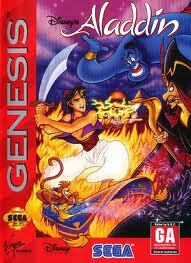 When it comes to video games the biggest debate is what was better Super Nintendo or Sega Genesis and a subject often brought up is the Aladdin games people still to this day will argue which version is better the super Nintendo platforming adventure game or the sword fighting action platformer on the Genesis. I was a sega kid growing up and I feel the super Nintendo version gets way to much praise (yes I have played it all the way through) so today I will review and try to defend the Aladdin game I grew up with. A lot of classic licenced games are just a way for developers to make money so the arrangement of levels didnt really matter as long as developers made money and the kids are quiet right? Wrong this ruined video game experiences for me as a kid because if I was playing a game based on one of my favourite movies I wanted the levels to be in the same order as in the movie so that I got a fun experience which made sense. 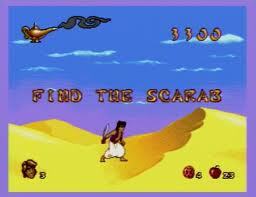 Aladdin kind of did this and by that I mean yeah the levels are in the correct order for the most part but some levels in the game didn’t make sense as they didn’t follow the movie at all, for example their is a stage in the desert where aladdin needs to find the scarab to open the cave of wonders but according to the film Jafar already had the scarab. This does annoy me but to be honest it doesn’t annoy me that much because there isnt many stages like this in the game and like I said for the most part the level order is spot on. For me the best aspect of the game is the animation, sure the super Nintendo version looked gorgeous and was burting with colour while the Genesis version was kind of MS DOS looking with very faded colours. 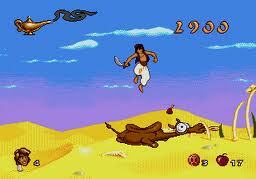 The Genesis version did have one advantage in the graphics department though and that was the realistic animation on all of the character’s, honest to god the animation in this game is amazing for a Genesis game, nthe characters have real looking movements which help bring the game to life allowing to game to feel like your in the movie, Every thing from jumping on a camel, running over hot coal to cutting an apple in half just looks awesome and this is something the super Nintendo version didn’t do so well. You know I said that the overall look of the game is kind of MS DOS looking well sadly I have two gripes about the music in this game the first problem is that the songs are in the wrong order so that kind of ruins the experience and to top it all off the music sounds very MS DOS and this can get really and annoying, really fast. On the bright side it isnt as atrocious as that final stage music in Mc Kids which usually causes me to mute the tv. My final complaint is that unlike the super Nintendo version the Genesis version has no save feature or password system. This game isnt easy so not having these features is not the best idea since this is supposed to be a children’s game and since the game is pretty short (the ending is lame by the way) it may have been fair to have unlimited continues, but you can gameover in this game and if you do its back to square one, the games awful platforming does not help. You can buy continues (wishes) and lives from the selling dude, but come on kids don’t want buy stuff they just want to progress and kill things. 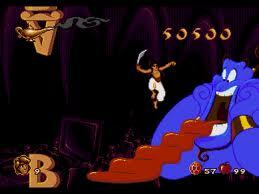 I’m going to rate aladdin a 7/10 a great game which could have been a lot better. Oh and as much as I love this game I will agree that the super Nintendo version is the better version of the game but at the end of the day the super Nintendo version was made by Capcom while the Genesis version was made by Virgin games so what did you expect.